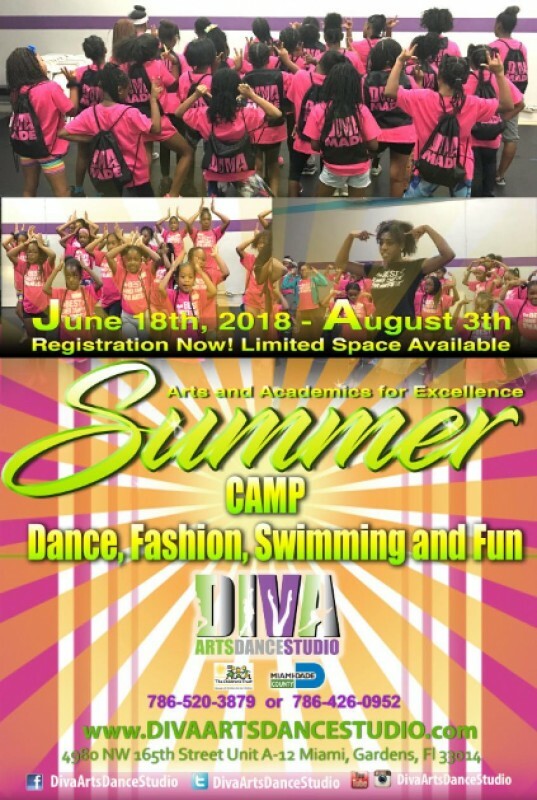 Diva Arts Dance Studio presents our summer camps, which will be held June 19, 2018 – August 3, 2018. The Arts & Academics for Excellence Youth Summer camp offers a full day of interactive activities in the performing arts. Open to ages 5-14, this camp is both engaging and fun, while culturally enriching for youth. Open to ages 5-13. The Arts & Academics for Excellence Youth Summer Camp is a 7-week camp that provides a full day of interactive activities in the arts. Classes are taught in dance, fashion design, choreography and personal development. 4.) The opportunity for to build self-esteem, positive peer relations and self-awareness. 5.) The camp also offers swim safety classes, weekly field trips and free breakfast and lunch.